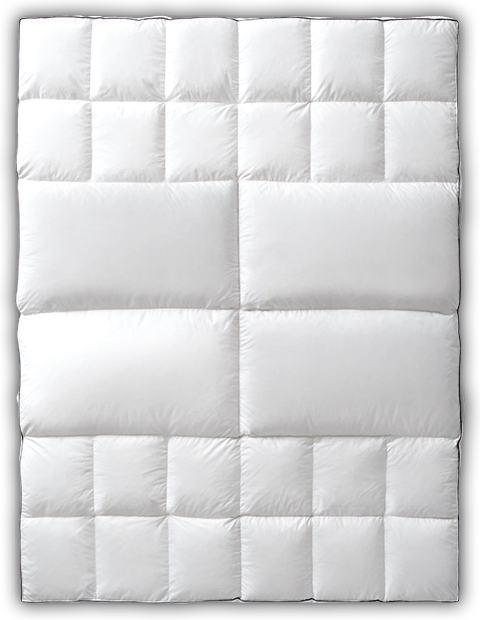 Sleep better by settling into our Lumbar™ Feather Bed mattress topper with extra-large central chambers providing special support to your lower back. This targeted support means you can drift off to a deeply restful sleep and wake up feeling refreshed. Treat yourself to some well deserved pampering by topping your bed with our supportive Lumbar™ Feather Bed. Specially designed extra large chambers in the lower back area deliver targeted relief. The horizontal baffle design keeps the Resilia® feather fill exactly where you need it. Lie down and feel the comfort of having your shoulders and hips gently cushioned to encourage a restful night’s sleep. The durable 230 thread count, 100% cotton cover is completed with a 2” gusset that creates a fabric wall to prevent the edges from flattening out and easy care handles for fluffing make easy work of moving and refreshing this fluffy feather topper. Specially positioned, overfilled chambers support your lumbar or lower back area in this patent pending design created to deliver a refreshing night's sleep. These lumbar chambers are oriented horizontally to contour to your body keeping your spine in healthy alignment. Multiple smaller baffle box chambers at the head and foot provide cushioning support to the rest of your body. Twin - 40" x 76"
Full - 55" x 76"
Queen - 61" x 81"
King - 77" x 81"
Cal King - 73" x 85"